IPAF's (International Powered Access Federation) MEWPs For Managers is a 1 day training course aimed at managers and supervisors who need to safely manage work at height activities and the use of mobile elevated work platforms (MEWPs). On successful completion delegates will receive a Internationally Recognised certificate (valid 5 years). 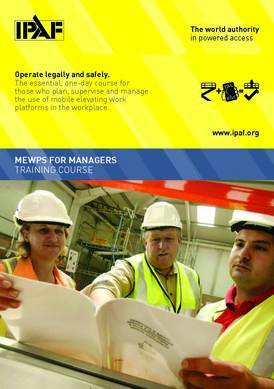 Those who hold a valid Powered Access Licence (PAL) for operating equipment can have the MEWPs For Managers (MM) category added to their PAL card. This course is aimed at managers and supervisors who's work includes or will include planning, supervising and managing of working at height that includes mobile elevated work platforms (MEWPs) and the operators of this equipment, without them being the person using the equipment themselves.